In today’s fabulous video I’m sharing with you one of my ultimate pinup tips, demonstrating a tutorial on how to wear your vintage clip on earrings pain-free! Many of us pinup girls adore vintage clip on earrings but after a while they begin to cause discomfort and sometimes even quite a bit of pain. In this video I give a tutorial which will work for most earrings and some extra advice just in case it doesn’t! Thank you for supporting my fabulous lil channel, more vintage fun coming soon! October 10th: Casual Vintage Classes: Stretch, Strength and Splits. October 20th: Sparkles Goes To Hollywood. October 27th: MELBOURNE Noir Exotique for The Australian Burlesque Festival. November 19th: Moonlight Serenade (live burlesque performances accompanied by a live band). December 3rd: Australian Tattoo Expo Grand Final. 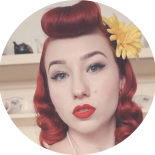 This entry was posted on October 12, 2017 by Miss Lady Lace in Uncategorized and tagged 1940's, 1950's, blogger, clip on earrings, clip on earrings tutorial, glamour, miss lady lace, miss lady laces pinup blog, perth burlesque, perth pinup, perth pinup blog, perth pinup community, pin up, pinup, pinup blog, pinup blogger, pinup fashion, pinup girl, pinup life, pinup lifestyle, pinup perth, red lips, retro blog, retro girl, retro glamour, the perth pinup community, tutorial, victory rolls, vintage, vintage blog, vintage blogger, vintage fashion, vintage girl, vintage glamour, vintage perth, vintage pinup blog.